This is a rerun of an article I wrote on August 10, 2012. It seems to have regained quite a bit of relevance in recent days. I was thinking earlier today, how can I write about finance when Europe continues to offend people’s, and humanity’s, most basic dignity the way it does, but it does. It gets more incomprehensible by the hour, what happens there. But it does. So here’s a different view, 50+ years old, of what Europe could, and perhaps should, have been, instead of the sad and amoral place it has become. Just for perspective. One note: Freddy Heineken would never have allowed for toddlers to drown. He was not that kind of man. He would have sent in all he could to prevent more suffering. Europe no longer seems to have than kind of man. Or woman. No leadership, no vision, no humanity. No nothing. But Heineken didn’t just think about beer. When the European Union was formed, he devoted time to letting his light shine on that project too (Heineken was a known Europhile). What he brought to the table was that, of course, he knew Europe well, from his own unique personal business experience. He oversaw, hands on, not just sales, but also marketing in all the different European languages and cultures. Heineken didn’t trust that the European Union would work the way it was proposed – and eventually organized -. According to him, if Europe were to be a success, it would have to be divided in far smaller units than the nation states that had been formed post-WWII. 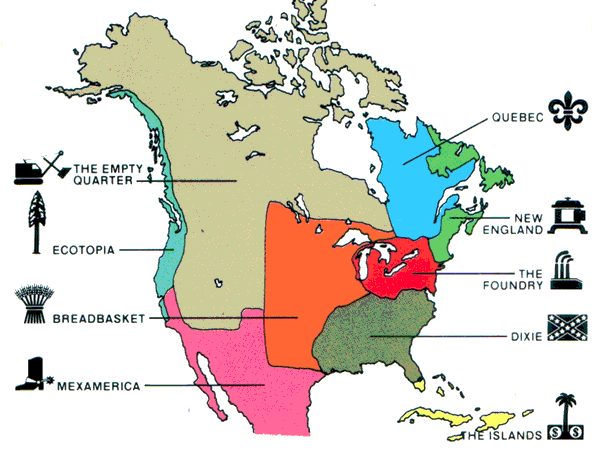 It’s reminiscent a little of Joel Garreau’s “Nine Nations of North America”, published in 1981. I don’t know if Heineken knew the book, but given his overall curiosity and his wide array of contacts with business leaders, politicians and artists all over the world (Heineken was a very wealthy man), it wouldn’t surprise me. Then again, his vision is based on completely different ideas than Garreau’s. Garreau divided the continent into units that he thought would be most coherent from the point of view of culture, political ideals and economic interests. Interesting notions, and a good book to pick up. Back to Heineken, who would have found Garreau’s units far too sizeable for his liking. He was thinking along the lines of optimally manageable untis. Immediately after the 1992 Maastricht Treaty saw European nations sign away the first real chunks of sovereignty, Freddy Heineken published his pamphlet The United States of Europe (A Eurotopia? ), written with Dutch historians Henk Wesseling and Wim van den Doel. The underlying idea here is that the individual units (statelets) should have no more than 5-10 million inhabitants. [..] If the EU was considered a country, it would be seventh on the list of biggest countries and third on the list by population size. And, as officials in Brussels never tire of repeating, first on the list of biggest economies. The time is [..] gone when people were ignorant and obedient. The time when they did not annoy their leaders with demands of transparency, efficiency, democracy and accountability. Technological progress has always led to political turbulence, often at the expense of those in power. The Internet, just like the printing press before, gives people access to information and the power to create and distribute, undermining establishments everywhere – not only in the Arab world. That is why states are doing what they need to accommodate an ever more demanding and emancipated people: decentralise. The UK, Germany, France, Spain, Italy: all have passed down powers over the last couple of decades. The closer the power, the more transparent, efficient, democratic and accountable it is. Everything which has a function, one could argue, has an optimal size. A pen can be bigger or smaller, you still need to be able to use it. The European welfare state has multiple functions. It needs to protect its territory from outside, uphold the rule of law, provide healthcare, education, take care of the roads and the forests and – to a more or lesser degree – distribute wealth. The problem is that each of those functions has its own optimal size and that, as the world continues to change, they continue to diverge. The result is not that the state does not work anymore – it just does not work very well. Like a pen as big as a broom or as small as a splinter – you might still be able to use it, but it is not very practical. Heineken called it “Eurotopia” – a contraction of Europe and utopia. He was well aware of the skepsis the idea would garner. But radical times call for radical measures. And the way things are going, I prefer utopia over dystopia. “(…) Heineken was convinced of the positive consequences of this process of the decay of centralism in favour of a Eurotopia as he called it. Immediately after the signing of the Maastricht Treaty in 1992 many were already afraid of a Europe that was becoming too large and too powerful, despite the fact that, as an antidote for this, a representational Committee of the Regions had been included in the Treaty in order to weaken these tendencies and, at the same time, answer the call for more regional autonomy. Initially, as a hypothetical response to this, Heineken went public with his plan for a United States of Europe. This involved a union composed of 75 independent states, created on the basis of political, historical, linguistic, cultural and ethnic affinities and sensitivities. Taking cultural differences into account in precisely this way would strengthen Europe as an entity. Although nothing was ever done politically as a consequence of this idealistic proposal, the underlying analysis is not inconsistent with developments in the years that followed – on the contrary. The proposed decentralization and federalizing of Europe on the basis of smaller geographic units proceeded from the central idea that it would prevent conflicts and promote stability and equality. This assumption was based, on the one hand, on the theory of the British historian C. Northcote Parkinson that smaller national units could be less centralized, more efficient and therefore more stable, and, on the other hand, on the thesis of the Austrian sociologist Leopold Kohr (1957) that ‘bigness is a problem’. In effect, both embroider [Denis] de Rougemont’s initial preference for a regionalized, federalist Europe. As early as the late 1960s, as a result of the European Communities, a process of growing regional autonomy had slowly got under way. 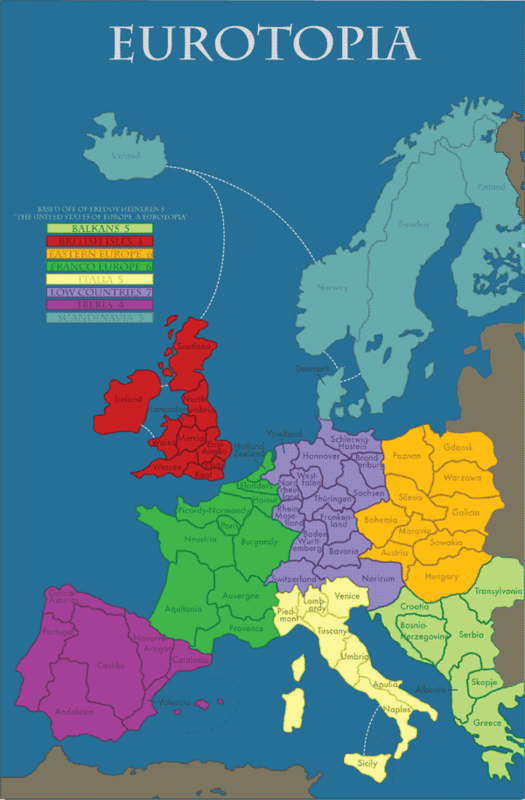 The converging supranational and diverging national forces would, it was supposed, bring Europe more to its ‘natural state’, preserving the various regional identities. Because of regionalist tendencies the nation-state network was breaking down, and within various member states regions were gaining far-reaching autonomy. The map of Heineken’s utopia could quite feasibly serve as the blueprint for a dystopia. When the financial crisis starts to bite for real, and it will, count on it, it appears inevitable that nations and/or parts of nations begin preparing for independence. There are plenty of regions in Europe that hang on as parts of larger entities only for economic reasons. When these reasons no longer exist, appeals for separation will become louder. It won’t be a coherent movement, far from it. It will be chaotic. But there seems to be no way that certain regions will not fall prey to populists, nationalists, and in general the resurrection of age-old ideas that never disappeared, but that simply lay dormant under a thin veneer of riches. Why would the Catalans or the Basques elect to continue to be a part of Spain, when the government in Madrid has nothing to offer but empty coffers? Why would they let others decide for them when that brings them no economic advantages? Any charismatic leader might convince them that they would be better off as a separate unit. And that leader might be right to boot. Why should the Scots remain in the United Kingdom? And what might happen in for instance Galicia, Silesia, Moravia, regions that have seen many different rulers in recent history only? 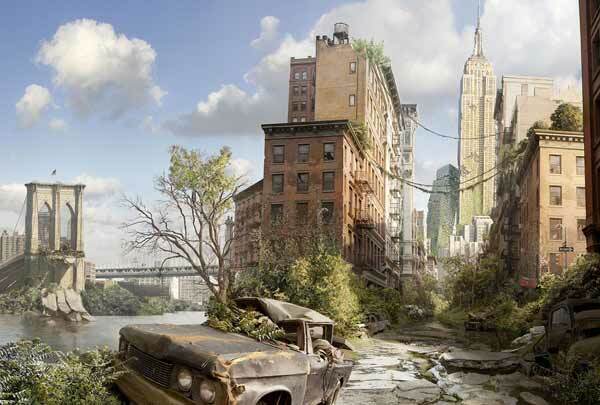 What ancient cultural, religious or other divides will rise to the surface all over again? It is not at all imaginary that regions want (back) their independence. And neither is it that borders between regions will be contested, that people will be told that only warfare will be sufficient to show “those over there”, who committed untold horrible if not unspeakable atrocities an untold number of years ago, that now is the time to avenge the ancestors who died to defend the land they now live on. For obvious reasons, we call this scenario the Balkanization of Europe. It will not develop exactly along the lines and borders that Freddy Heineken saw as desirable. But we may well one day think back of that map, and not for the reasons Heineken meant it for. I think along those lines on a regular basis when I see the likes of Monti, Draghi and Rajoy present their grandiose plans to save the union, and their place in it, far more costly than any can afford, as it’s sinking ever deeper into its overwhelming debt morass.